Business leaders talk about the importance of setting the right culture in their workplaces. After all, the culture of a workplace is what binds people together to accomplish goals. Recognizing that those dynamics create a healthy, happy and productive work environment is crucial to the success of any business. And what makes employees happy? Studies show that when people are engaged in endeavors greater than themselves, they have stronger connections to each other and their communities. Companies providing that opportunity for philanthropy for their employees see greater productivity, decreased attrition and increased revenue. As we celebrate our 10th anniversary, B2 has made a personal commitment to “10 Give Backs” this year. Every community has organizations and people in need. We welcome you to join us as we give back, get involved and make a difference! Encouraging and supporting philanthropy within your own workplace starts a domino effect with nothing but good results! This month, we’d like to spotlight our very own Julie Ellison – B2’s HR expert. Julie is passionate about animals and has an especially soft spot in her heart for rescue dogs. 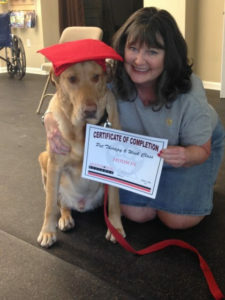 She has been a volunteer and foster parent with Heart of Texas Lab Rescue (HOTLR) for over 15 years and is committed to the organization’s mission of placing dogs in need with foster homes until they find a forever home with a loving, dedicated owner/family. HOTLR is instrumental in saving dogs from animal shelters where they risk euthanization. However, they are only able to save as many dogs as they have foster homes so their need for help is a constant. The fostering experience is especially meaningful as these dogs make the transition into new homes. Julie can speak from personal experience having adopted Hudson through HOTLR. Hudson is an 8-year-old yellow Lab that was born at the HOTLR’s president’s house after his mother was found wandering the street, taken to a shelter and then brought into the HOTLR program. He has been to many events around Austin and is always eager to represent HOTLR and the quality of Labs that we have in our program. Please join B2 in making a contribution to Heart of Texas Lab Rescue or any dog rescue organization of your choice (a list of other organizations appears on the HOTLR website). The point is to give. The reward is knowing that you made a difference. As a full-service management consulting firm, B2 partners with our clients to deliver solutions that help solve their most complicated needs. Utilizing decades of industry experience and functional expertise, we can assist you in growing your business in a strategic way and help prepare you for the future.